Liberty Street was originally built as a typical 30 foot wide city street, but was widened to 70 feet in 1955 to serve as a connector to Interstate 471 and Reading Road. The widening required a significant number of building demolitions and physically severed the neighborhood into two halves. 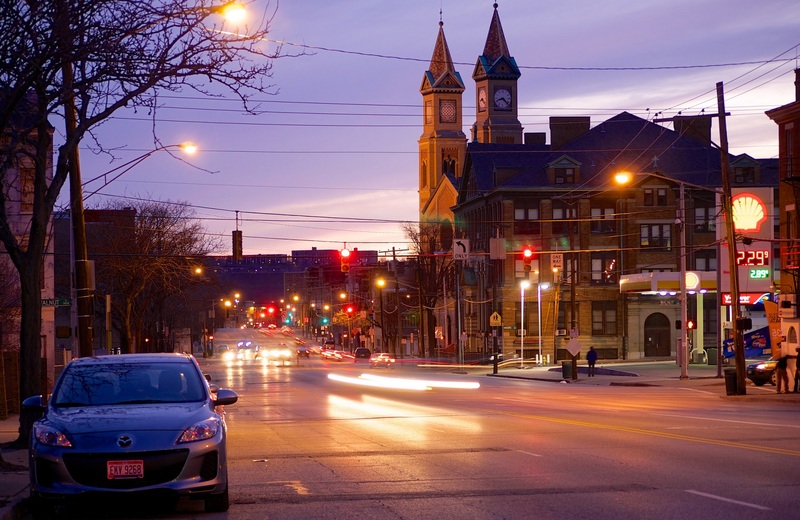 Over the past fifteen years, as the southern half of OTR has redeveloped, the northern half has seen much less investment–and most of this has been in the area around Findlay Market, not along Liberty Street. It is uncomfortable as a pedestrian to cross Liberty Street, as the walk light changes almost immediately to a countdown timer, and it takes about a half a minute to cross walking at an average speed. The current design, at 7 lanes wide, is optimized for speeding cars and is wholly inappropriate for a dense urban neighborhood like Over-the-Rhine. Liberty Street is too wide and the City knows it. At an open house event in 2015, the City of Cincinnati first proposed a “road diet” for the street. Over the next several years, they facilitated several community input sessions regarding what came to be called the Liberty Street Safety Improvement Project. Each of these meetings was held at the Woodward Theater for a packed audience of people who live, work, or spend time in Over-the-Rhine. Members of the community spoke about the need to make Liberty Street safer for all people, including pedestrians, bicyclists, and transit riders–not just drivers. Liberty Street prior to 1955. A building at the southeast corner of Liberty and Race is demolished for the widening of Liberty Street in 1955. DOTE staff took the community input into consideration and ultimately presented their final plan to OTR Community Council on October 23, 2017. The plan called for removing two lanes from the south side of Liberty Street, reducing the crossing distance for pedestrians and discouraging excessive speeding. Additionally, this will free up land for new development along the south side of the street, providing space for new housing, retail, or office space. As of June this year, the project was set to go out for bid this fall and begin construction in 2019, according to the city’s website. Unfortunately, in August, the City Administration decided to “pause” the Liberty Street Safety Improvement Project because of concerns about the traffic that will be generated by the new FC Cincinnati stadium in the West End and a sudden concern about how the installation of a new water main would be funded. The Liberty Street plan, which has been in the works for years, has now been mothballed because of a stadium plan that didn’t exist until a few months ago–publicly, at least. To make matters worse, City Council previously denied the OTR Community Council’s request to be involved in the stadium’s Community Benefits Agreement, saying that OTR would not be impacted by the stadium; but now seems that Over-the-Rhine may be negatively impacted by the cancellation of the Liberty Street Safety Improvement Project. The City Administration’s concern about traffic is bizarre, as the narrowed Liberty Street would maintain five lanes of traffic during peak traffic times, the same number of travel lanes that exist today. Typically the outer lanes would be used for parking during off-peak periods, but the city could install “no parking” signs on game days. Therefore, the impact on traffic through the neighborhood would be minimal or non-existent. As for the water infrastructure, that can be solved through a mix of council and departmental leadership. An example of that is a potential solution presented by Councilmember P.G. Sittenfeld to use the money from the sale of the Whex garage to plug the budget gap. We urge the City Council to keep the city’s promise to the Over-the-Rhine community and pass legislation requiring the City to follow through with the Liberty Street Safety Improvement Project.